March is by far my least favorite month of the year. I get a little depressed, a little bored and a little impatient with it all. The snow is dirty, the air is damp. It’s cold, it warms up, it’s cold again. March can’t make up it’s mind and it bugs me. We got some fresh snow. About eight inches. It cleans up that dirty stuff a bit which is good, but it’s March. Aren’t the daffodils supposed to be popping out by now? There’s a nice little treasury in Etsy that makes me feel a little better about this time of year. 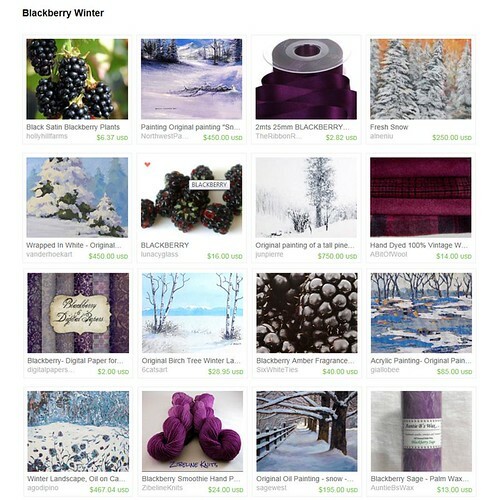 The curator names it Blackberry Winter. The purple colors remind me of winter and spring all at once. They make March less annoying. I’m honored to have my Blackberry Sage candle featured in the collection. If you’re interested in any of the items in this treasury, just click on the image and you’ll be transported to Etsy where you can have a closer look. Blackberry sage sounds scrumptious! Hold onto a 3″ pillar for me if you have one. If I don’t have one you know I can always make one for you! Lovely items to perk up a gloomy month! I agree! Purple isn’t my favorite color, but it seems to fit right in this time of year.